In my world, 2011 was the year of the modest pop star costumes. 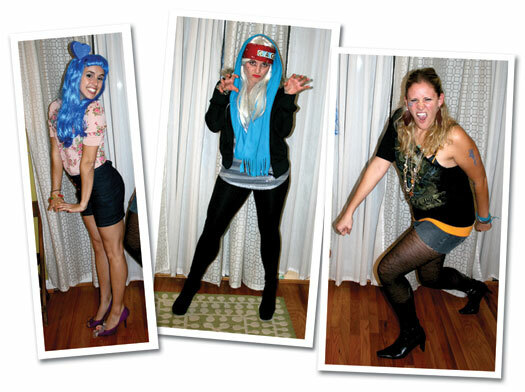 Katy Perry, Lady Gaga, and Ke$ha all hit the streets of Cincinnati this weekend. Best news? My Katy Perry costume cost me a total of $15. Here's the break down. D. High waisted-shorts : $.50 These were a pair of jeans that didn't fit correctly. I cut off the legs, and used the fabric to sew a waist band that Velcroed® in the back. Because it's the same fabric, the band just appears to be a part of the shorts themselves. I bought pink heart buttons and sewed them to the front for a faux zipper. E. Gummy Bear Jewlery : I count this a nil because we ate the rest of the gummies. 1. Pressed Paper box in the shape of a heart. I bought mine at Michaels. Approximately 4". Discard the lid. 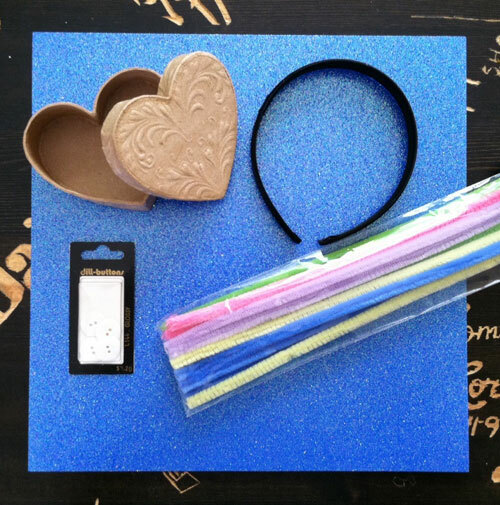 Outline the heart on the back of the scrapbook paper twice, add about 3/4" to each outline, and cut. Using the tacky glue, cover both sides of the box with the glitter paper, folding over the edges and gluing them to the sides. Cut a long strip of blue paper that matches the width of the heart. Starting at the top-middle of the heart, glue the paper around the edges of the box. Now use a sharp knife or scissors to cut two slots, the first about an inch from the bottom of the heart, the second about 3/4" from the first. Twist the knife to widen the slots. Shove the headband into the top slot and push it through the bottom slot. Pull through until the the heart is about 2/3 of the way up on the headband. 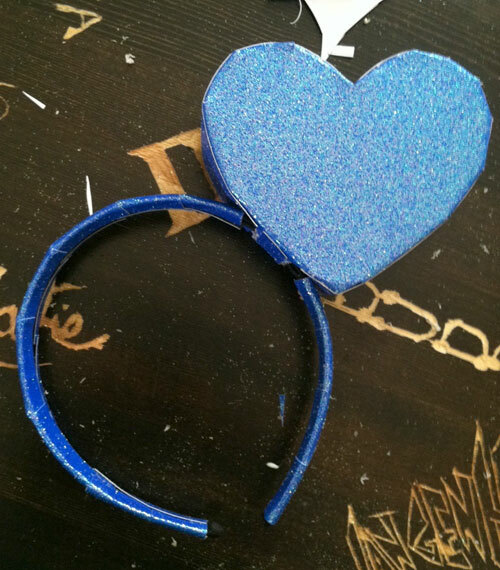 Now just cover that headband with the remaining blue paper, and you've got a Katy Perry headband! Many stores have sales on last year's Christmas supplies right now. I lucked out at Hobby Lobby and found candy Christmas ornaments for 50% off. 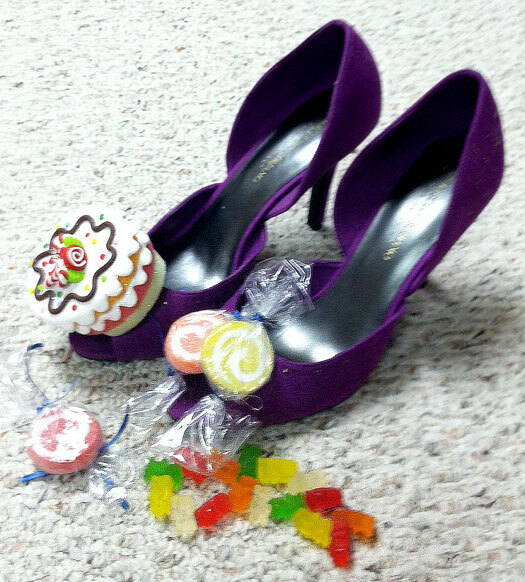 I tied the cake and two candy ornaments to my shoes with thin blue ribbon (after I used baggies to make the candies look like peppermints). The candy to the left I turned into a ring, also just with the blue ribbon. The gummy bear bracelet is simply really gummies that I ran a threat through with a needle. So simple! I hope everyone had a safe, honorable, happy Halloween! There's an exciting guest post in the works for tomorrow! You are so creative! Love te costume! Guest Post : This time it's me!